Listed below are foods that started in Mumbai. These food dishes originated in Mumbai and are unique to Mumbai. Pav Bhaji is a popular street food that originated in Mumbai/Bombay. The origin of Pav Bhaji can be traced back to Bombay’s textile workers in the 1850s. Pav Bhaji consists of two parts – “Pav”, which is a small bread, and “Bhaji” (Vegetable), which is a mash of potatoes, tomatoes and boiled vegetables such as peas, cauliflower, capsicum/pepper, etc. The mashed vegetables are flavoured with “Pav Bhaji Masala”, which is a spice mix similar to “Garam Masala”, consisting of cumin, coriander powder, pepper, cardamom, dry chilies, cinnamon, cloves, mango powder and fennel seeds. For added flavor, a dollop of butter is added to the “Bhajji”, the bread (“Pav”) is toasted with butter and chopped onions are served on the side. 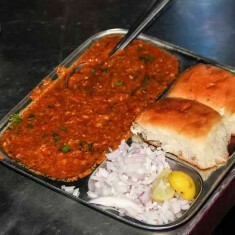 In street stalls and restaurants, Pao Bhaji is usually cooked on a large flat utensil (“Tava”). 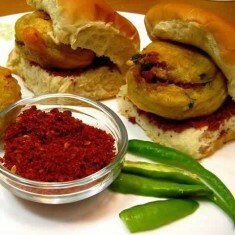 Vada Pav is a tasty Mumbai street food that is similar to a burger. The patty is called the Vada (or Wada) and is made of coarsely mashed potatoes dipped in “Besan” (Channa Lentil flour) and deep fried. To add flavor to the mashed potato, spices (chili powder, cumin, coriander, mustard seeds, turmeric, garlic, etc) and herbs (chopped coriander leaves) are added. For further flavor, a little green chutney, sweet chutney and a dry red chilli-garlic powder is added to the bread (“Pav” or “Pao”). Wada Pav is quick to prepare and cheap and is usually sold at road side hawker stalls. Most Vada-Pav stalls also serve Samosas with Pav and Bhajias with Pav. Vada Pav originated in Mumbai and is an unique food from Mumbai. “Pav/Pau/Pao” is derived from the Portuguese word for small bread. Mumbai used to be a Portuguese colony before it was handed over to the East India Company. Indians travelling to China and the Far East are surprised that Chicken Manchurian is not a dish on the menu. How can the most popular gravy dish in Indian Chinese restaurants not be on the menu? 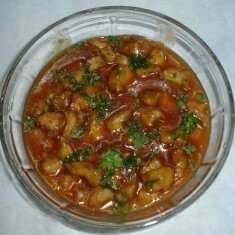 This is because Chicken Manchurian is the invention of Mumbai chef and restaurateur Nelson Wang. According to legend, Nelson Wang invented Chicken Manchurian in the 1970s, when a customer requested him to serve him something different. Today, most Chinese restaurants in India serve Chicken Manchurian, and its offshoots (Veg Manchurian, Chilly Chicken, Chicken Schezuan, Veg Schezwan, etc). Chicken Manchurian consists of two parts – a Chicken “Pakora” (boneless chicken pieces coated in corn-flour and deep fried) and a dark brown gravy made of garlic, ginger, soya sauce, chilies, salt, sugar and corn flour. Bhel Puri is a snack that was started in Mumbai. Before the advent of Bhel Puri, “Chaat” food dishes were popular in North India. 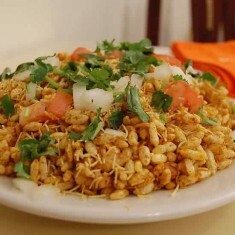 In Mumbai a fusion of the North Indian Chaat and Gujarati snacks occurred and the unique Mumbai Bhel Puri was discovered. Bhel Puri is a mix of Puffed Rice, pieces of boiled potatoes, chopped onions, sweet chutney, green chutney with chillies, sev and a Puri/Papadi (small round deep fried flour). Usually a Bhel Puri seller also sells Ragada Pattice, Sev Puri and Pani Puri. Sev puri is a mix of chopped onions, boiled potatoes, sweet and hot green chutney, sev and seasoning, served on a Puri/Papadi. Mumbai’s Bhel Puri trade is dominated by sellers from UP. “Vithal Bhelwala” near VT station claims to have invented Bhel Puri. 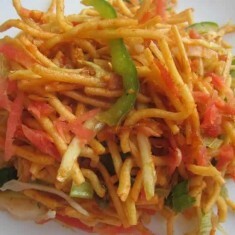 Chinese Bhel is a food snack that was invented in Mumbai. Recipe for Mumbai’s Chinese Bhel consists of a serving of boiled noodles that are deep fried, mixed with cabbage, onions, green onions, capsicum/pepper, carrots, Schezuan sauce, soya sauce, chili sauce and salt. Just like Bhel Puri, Chinese Bhel is easy to prepare by simply mixing the ingredients together. Road side Chinese Bhel hawker stalls are gaining popularity in Mumbai. This food innovation is now done to other staple foods like dosas, pizzas, etc. Road side dosa makes offer patrons the choice of Chinese dosa, Schezwan Dosa, Kerala Dosa, Mysore Dosa, etc. 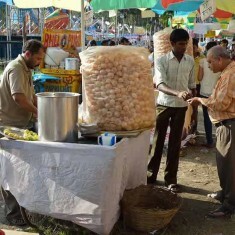 Pani Puri is a popular street snack in Mumbai. A puri (hollow, small, round, thin, deep fried flour) is filled with sweet tamarind chutney, tangy water and a filling of either Ragda or potato or boiled dal or onions. Although Pani Puri is not a Mumbai invention, what makes the Mumbai Pani Puri unique is the tang and bite in the water and the use of warm “Ragda” (small white chick pea) as a filling in the puri. Different versions of Pani Puri are popular throughout North India, East India, Nepal, Pakistan and Bangladesh. The equivalent of the Panipuri is called the “Gol Gappa” in North India, “Bataasha” in Western UP, “Phuchka” in West Bengal/East India/Bangladesh, “Phulki” in Bihar, “Gup Chup” in Odisha, and “Pakodi” in Gujarat. 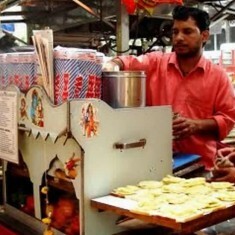 Many Mumbai Pani Puri stalls also sell Ragda-Pattise, Bhel Puri, Sev Puri and Dahi Puri. The dishes of “Prawn Koliwada” and “Koliwada Fish” were first introduced in the small restaurants in Mumbai’s Guru Tegh Bahadur Nagar (GTB). GTB Nagar was previously called Sion Koliwada, hence these dishes are called Koliwada Prawns/Fish. Mumbai’s GTB Nagar has a large population of Sikhs and Punjabis and is sometimes referred to as Mumbai’s mini-Punjab. After partition, refugees from Pakistan were housed in this area. Many of the restaurants and eating places in GTB Nagar are run by Sardars and Punjabis. Prawn Koliwada was invented in one such restaurant. 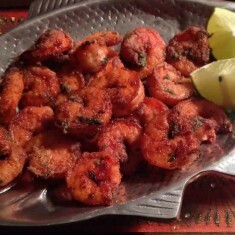 Prawns and fish are marinated in the special Koliwada batter and deep fried. The Koliwada marinate imparts a typical red colour and is made of flour, red chili powder, ginger-garlic paste, garam masala, lemon juice, yogurt, fennel powder and salt. Amritsari Fish from Punjab also has a similar marinate. The recipe of the Mumbai Sandwich is simple; butter and green mint chutney is spread on two slices of bread and slices of cucumber, boiled potato, tomato, onion and beetroot are placed between the breads. What makes the Mumbai Sandwich unique is the large number of road side hawkers selling this sandwich. This sandwich is popular because it is nutritious, filling, hygienic, quick to make and cheap. With time sandwich makers have introduced new variants, like the grilled sandwich, masala sandwich, Chinese sandwich, chili sandwich, samosa sandwich, etc. Tibb’s Frankie was started by Mr Amarjit Singh Tibb. In 1967, Mr Tibb travelled to Beirut, where he was introduced to the Lebanese food custom of putting stuffing in pita bread. Back in Bombay, Tibb and his wife experimented and came up with the Tibb’s Frankie. 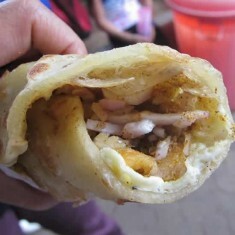 A Frankie is a flour wrap rolled with chicken/mutton/vegetable stuffing, chopped onions, vinegar, chilies, tamarind water and a tangy masala powder. Tibb’s Frankie is a registered brand name, but there are many food stalls around Mumbai that sell similar wraps. Kolkata has its Kathi Roll and Mumbai has its Frankie. 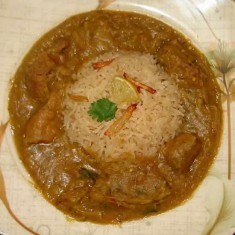 Parsi food is a mix of Persian and Gujarati cuisines. Parsi Restaurants (Britannia and Co) and Irani Restaurants (Kayani Café, Yazdani Restaurant & Bakery, Sassanian Boulangerie) have been an important part of Mumbai’s food scene. Even though Parsee food is not unique to Mumbai; this cuisine has been added to this list because Mumbai has the largest population of Parsis in the world. Mumbai residents have a soft spot for the old school Parsi/Irani restaurants. Interesting Parsee/Irani dishes include Patra-ni-machhi (steamed marinated fish, wrapped in a banana leaf), Saas-ni-machhi (fish fillet in white gravy), Dhamsak (Mutton/Chicken/Vegetable in a 4 lentil gravy) with brown rice, Salli Boti (Meat gravy garnished with matchstick style potato fries), Chicken Farcha (fried chicken), Akuri (scrambled eggs), Lagan-nu-custard (caramel custard), shrewsberry biscuits, etc.